Uh-Oh…the liberals are having a conniption, they’ve decided that President Trump ousted Gen. McMaster and brought in Amb. John Bolton because he is assembling a war cabinet. After all, Bolton has a reputation as a saber-rattler and there were stories (sadly on the conservative side) that McMaster fought against Trump’s pro-Israel policies, he supports the Iran deal, thinks Trump was too hard on North Korea, and not hard enough on Russia. Allow me to start with the McMaster rumors–-BULL! This site has already addressed General McMaster’s strong relationship with Israel. He was one of the authors of the president’s strategy announced in October that he was not going to recertify the Iran deal and giving the lousy deal’s supporters in Congress and in Europe six months to make better before the U.S. pulled out. A Wall Street Journal editorial released after today’s announcement praised McMaster for helping the President maneuver through the North Korean crisis. As far as Russia goes, McMaster’s policy before the 2016 election was to re-think the way the U.S. military approached Russian aggression without getting the nation into World War III–but he did not eliminate the possibility of talks. As for Ambassador Bolton, he was chosen for a few reasons. Bolton’s style is very direct and bottom line. The president knew that if he was going to replace McMaster it would be best if he did it with a well -known name, to calm down the claims of chaos. And finally, while it’s true that the Ambassador is more “hawkish” than the General, despite what the liberal media claims— President Trump likes to be challenged with differing positions (just as long as the challenger understands that once the president makes his decision it’s time to fall in line). In a Wall Street Journal op-ed last month, Bolton outlined a legal case attacking North Korea before it can develop a first strike against the U.S. capability. To be honest, despite the more dramatic language, his argument wasn’t far removed from the President who promised that rocket man would not be allowed the ability to put a nuclear weapon atop a missile that can reach American territory or the territory of our allies. Over the past year, Ambassador Bolton has periodically visited the White House, to advise the POTUS. Those visits built a relationship between the two. Bolton certainly has the credentials for the position he served as undersecretary of state for arms control and United Nations ambassador during the Bush administration. The only issue where he diverges from the President is that he was an early advocate for the Iraq War, which President Trump has severely criticized. The liberals need to calm down because the bottom line is no matter who the national security advisor this president is not going to be bullied into a military action that isn’t crucial to protect America and her allies. 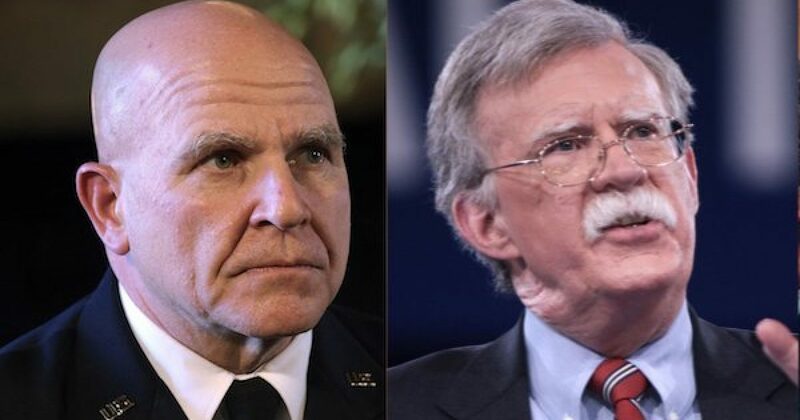 And to be perfectly honest it is much easier for Bolton to rattle sabers as a TV commentator with two minutes to be controversial and make an impression, than a National Security Advisor who makes recommendations that could be the difference between war and peace, life and death. John Bolton is a smart man who understands his role. I was and remain a big fan of General McMaster, who served this country honorably for thirty-four years. But if he was going to be replaced, John Bolton who was described by Rep. Lee Zeldin as “Ridiculously knowledgeable” is a perfect choice. He will be an asset to the administration, and more importantly to the security of the United States.